With only 50,000 men in attendance last annum, Promise Keepers rallies are soon to be extinct. But how can we forget that, only a decade ago, that many men were present at each event? 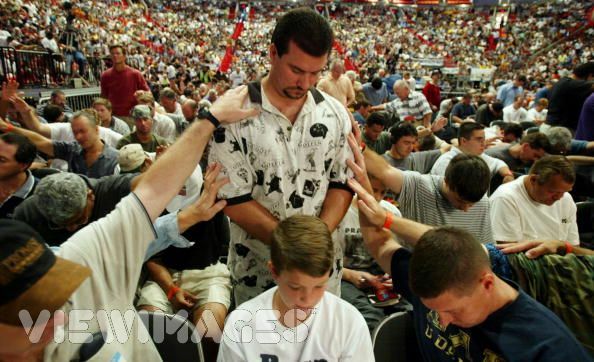 I joined in on a San Diego rally in 1996 and was deeply impressed by the sight of men streaming down the aisles of Padres stadium to confess their sins, be prayed over, and trained in the ways of godly manhood. Men – Christian and would-be Christian, of all ethnicities, ages five to 95 – longed for and received an initiation of sorts. As demonstrated in L. Dean Allen’s book, Rise Up O Men of God, Promise Keepers bore much in common with the Men and Religion Forward Movement, which, as the crowning expression of muscular Christianity in America sought to bring men to a place of social responsibility. Allen also points out key differences in the movements, and I add one more: Promise Keepers depended on rituals for a sense of initiation. The PK rally was in many ways a production of modern liminal space. How does one take men (who are used to TV dragging them away from their normal lives) and transport them into a generative, altered state of consciousness? Promise Keepers capitalized on the two strongest emotional forces they knew: the revival tent meeting and the football game. As for the first, the Evangelical men’s movement almost always warmed up their events with gospel music, and included an altar call as day turned to night. I remember being taken aback at the hellfire preacher recruited for the San Diego rally, but his message had its effect. A good portion of the men, maybe ten percent of the group, poured out onto the field to either “receive Christ” or re-commit their lives to him. The organ wailed as the penitents gathered around the preacher and wept over their shortcomings as males. There was the recitation of the sinners’ prayer and the laying on of hands. As for the second factor, I can only point out that there is nothing so deeply religious as team sports. 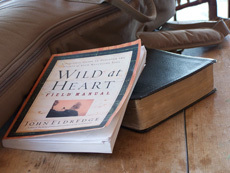 Any pastor will tell you that Sundays are a battleground for souls, viz., whether people will worship with the Christian fold or before the television. (For an iconoclastic presentation of this, see Higgs’ God in the Stadium.) But PK fused these two forces. Speakers James Dobson and Tony Evans on one side. Coaches Bill McCartney and Tony Dungy on the other. The religio-athletic mood had been set. And its initiating elders were in place. Yet, for all its direct and indirect ritual, Promise Keepers had a hard time manufacturing a modern initiation. Critics pointed out that the great majority of the men who reformed their lives were already committed Christians, husbands and fathers. The in-between liminal space of the revival-tent-turned-football-field was, in reality, already doubly familiar. It reflected the normal modus operandi of their church life and the typical arousal of sporting events. In other words, Promise Keepers was successful because it played out a script with which Evangelicals were already familiar, and called them to a life they already knew they were supposed to live. I do not doubt that many of these men were inspired to be better men and uphold their “promises” to wife, children, churches and Christ. I too was encouraged. But were we initiated that night? Was there a radical self-rearrangement, a moving from one stage to another, a journey into death and back into life? Perhaps the Christian men’s movement could not hope to achieve so much. That kind of initiation can only be had in baptism.